The Emergency Department at UBMC is a Level 4 Trauma Center, and a Stroke Receiving Facility. Walk-In ER patients should use the ER entrance on the West side of the hospital. Space is limited and we ask that a maximum of two visitors be allowed into ER patient rooms. We have recently renovated and expanded our Emergency Department, improving efficiency, privacy, safety and overall function. Additional patient rooms, large trauma rooms, bedside computers and an expanded medication room leads to improved efficiency. Along with private patient rooms and additional bathrooms, we also have a new entrance directly into E.D. with a private waiting area, greatly increasing patient privacy. The overall design of the new E.D. incorporates such features as increased room size, locked entry points and better visibility of all patient care areas which translates into a safer environment for patients and staff. The ER is staffed and equipped for emergencies and patient services 24 hours/day, 7 days a week. Board certified ER physicians are available at all times. Our staff is well trained in emergency care and we strive to make the patient experience the best it can be. When it comes to emergencies that need more specialized care, we are prepared. 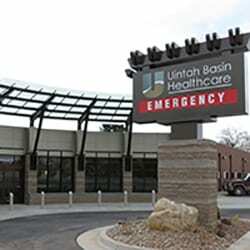 In an effort to enhance access to trauma and specialty care for residents of Eastern Utah, Intermountain Healthcare and Uintah Basin Medical Center have joined forces to bring Intermountain Life Flight to our area. The helicopter stationed at Uintah Basin Medical Center is one of two Agusta A109 K2 helicopters, which is designed for high-altitude flying conditions that exist in Utah. We have always taken the needs of our communities very seriously, and have strived to do what is necessary to provide superior care. At UBMC, the patient comes first.